Have tool kit; will travel. Guitar and bass players may know a little about truss rods and action, but few actually attempt adjustment. That's a shame, because a substantial upgrade in your performance can be realized with a properly set up axe. GrooveTech tool kits provide everything you need to work on your guitar or bass, and an Easy Setup Guide is included that takes the mystery out of it. Tools are professional grade and lifetime guaranteed. This tool kit is optimized for either guitar or bass, with a precision 6-in-1 screwdriver that contains two each Phillips and slotted tips, and two nut drivers (1/4 and 5/16-inch to handle Gibson and other truss rod nuts). The GTGK1 guitar kit has 11 hex keys that will fit virtually any make of guitar, color-coded gold for metric and black for inch sizes, and long pattern for easy access. Truss rod sizes have a ball-end. Also included is a steel ruler, string cutters, 15-blade thickness gauge, string winder, and capo. 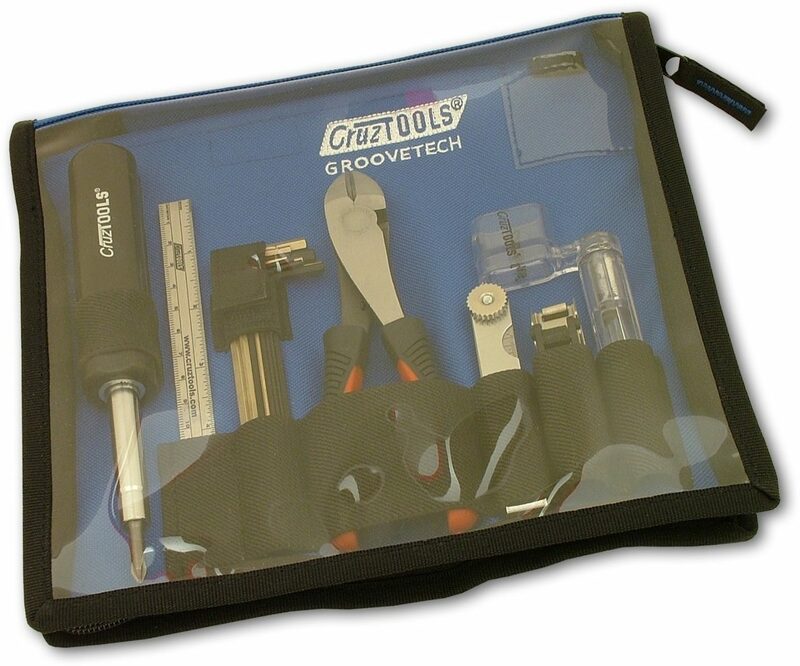 Your CruzTools GrooveTech tool kit contains a compartment behind the tools to store the Easy Setup Guide, your owner's manual, and a spare set of strings. Also included is a pocket to store your picks (picks not provided). With GrooveTech kits, you now have the tools and knowledge to easily set up your guitar or bass, and keep it that way. zZounds is an authorized dealer of CruzTOOLS products. This Cruz Tools kit needs to be at your practice spot. I haven't run into a guitar that I haven't been able to set up with this kit, and it's everything a novice-to-intermediate player will need to keep their guitars in line and playing smooth. Seriously, it's all there. Overall: Does what it says it does, kit comes with everything you'll need to adjust your guitar. I've even used the capo in a pinch, though it's not really meant for playing. Oh and it comes with a setup guide for the newb which is pretty helpful. This review has been selected by our experts as particularly helpful. "Great Product"
Sound: Sounds okay for something that doesn't make a sound. But once you use this kit to get your guitar set up properly your guitar will definitely sound and play much better. Feature: A guitar tech obviously put a lot of thought as to what should go into this kit. This kit contains everything that I need to set up my guitars, with one noteable exception: an offset screwdriver for adjusting floating trem claws. Otherwise I have a use for every tool in this kit. Some people may be put off by the seemingly delinquent capo, but it's there to capo off your first fret for measuring neck relief, NOT for barring off for playing in different keys. This kit will most likely fit into the outer pocket of most gig bags but it's a little too bulky to fit into any of my hardshell cases. Ease of Use: I still haven't quite figured out how to use the screwdriver yet...lol! But seriously, all of these tools perform their function well. There's an included setup guide to get you going, but if you don't really understand what you're doing with any particular procedure then STOP and take it to a tech to show you. No sense in ruining your guitar just to save a few bucks. Quality: Topnotch quality! No skimping here in the quality of the components. The cutters are plenty hefty to get the job done, the screwdriver has a strong feel to it, and the allen keys all seem sturdy enough. The flashlight is also very sturdy. Value: If you were to buy all of these tools separately you'd spend a lot more money and a lot of time running to different stores to find what you needed (been there. done that.). So it's definitely a great value. The Wow Factor: This should be on every serious guitarist's must have list. Overall: I already had a toolbox filled with accumulated tools and odds and ends that I've picked up over the years. But sometimes "more" means less. I could never seem to find the tool that I needed when I needed it. Now the most essential tools that I seem to use the most are in a nice compact case, ready to go. It's also very portable, which means I can take it with me instead of having to randomly grab tools out of the toolbox, usually taking way more than I'll need "just to be safe". Overall, a relatively inexpensive way to treat your guitar(s) right. 97 of 102 people (95.1%) found this review helpful. Did you?